People perceived that BP had too much control of the cleanup of the Gulf oil spill, according to testimony on Monday. 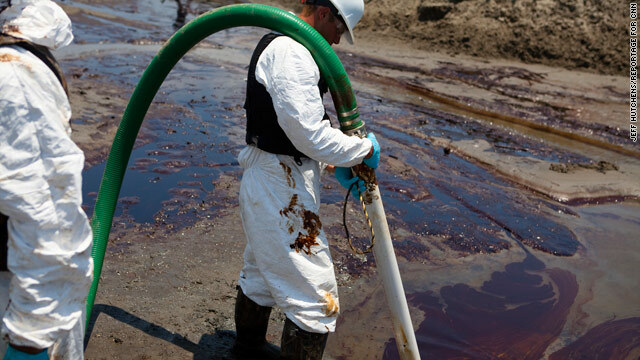 Washington (CNN) -- The public's perception of how the BP oil disaster was handled in the Gulf of Mexico eventually affected the response itself, National Incident Commander Thad Allen said during testimony Monday before the presidential oil spill commission. The appearance that BP was playing an inordinate role in the response "created a lot of concern," Allen said, even though contingency plans required the responsible party to take the range of steps BP took in the aftermath of the April 20 explosion aboard the drill rig Deepwater Horizon that ruptured the well. "The public's tolerance for the responsible party is inversely proportional to the size of the spill," Allen said. "I think procedures that worked terrific for the last 20 years became dysfunctional because of the perception of what was being done, not necessarily the reality. "When you have what I call the social and political nullification of a national contingency plan based on the perception of the role of the [responsible party], we have to deal with the perception," he said. In addition, the early estimates of the amount of oil pouring into the Gulf of Mexico "set a context for public skepticism" about the response, the commission's chairman said. "I believe the public pushback goes back to the skepticism that they felt when they were seeing on television a pipe that was pouring out oil and then hearing it was only 1,000 or 5,000 gallons or barrels a day," the chairman, former Florida Sen. Bob Graham, said after Monday's hearing. "It just doesn't compute." BP and federal agencies initially estimated less than 1,000 barrels (42,000 gallons) per day was leaking from the ruptured well. That number soon grew to 5,000 barrels, then ultimately to as much as 60,000 barrels (2.5 million gallons) per day. The commission's co-chairman, William Reilly, said he was disturbed by testimony from a senior scientist at the National Oceanic and Atmospheric Administration that researchers have not yet agreed on how to calculate future spills. "Clearly the technology is significantly improved," said Reilly, the former administrator of the Environmental Protection Agency. "The remote sensing that was described is better. A lot has been learned." But Reilly said he thought such changes "would have received a higher priority and that it would be underway at this time, frankly." "I didn't get the sense that even this morning, that the impact on the public of repeated wrong numbers is appreciated, because it did undermine confidence in the overall effort," he said. But Allen, a former Coast Guard admiral, said the estimates "weren't consequential in any of the decision-making I did." "We knew this thing had the potential to be much larger than it was. We never at any point relied on the 1,000 or 5,000 barrels a day (estimate)," he said. Allen was the first witness in the panel's third hearing as the commission investigates how the oil spill might have been handled differently, and to chart a course for future incidents. As the owner of the ruptured well, BP is responsible for the cost of the response and cleanup and could be on the hook for massive penalties as a result of the disaster. Allen said the company's financial responsibilities adversely affected the public's opinion of the oil giant. and the requirements facing BP seemed to "bring into question whether or not every decision could, should or would have been made based on what was best for the environment and the response itself." To improve credibility of those decisions next time, Allen suggested naming a qualified industry official to marshal resources while being insulated from financial and accounting responsibilities. Allen was asked whether the Coast Guard, and his job as the government's point man for the response, were provided adequate resources for a disaster of this magnitude. He said greater resources would have allowed a better response, but cautioned that some of the delay in ramping up the deployment of assets was due to additional time needed to convert funding into such resources as absorbent boom material. Research and development of mitigation strategies, such as the use of dispersant chemicals, must be done in advance, Allen added. "We can't be doing [research and development] in the middle of the spill response, which we tried to do this time. Those things have to be proven, on the shelf and ready when we need them," he said. Allen acknowledged a shortcoming in the response plan that failed to include a decision-making role for county and parish officials. And he said there needed to be a reconciliation between the economic impact of closing public beaches and contingency plans that call for allowing oil to reach those beaches for collection. "The economic impact of beach closures is significant, but there's a presumption in the response doctrine that you will push oil to a beach and it's going to be recovered there," Allen said. "I will tell you that's not universally agreed with in the Gulf." Adding Coast Guard staff to work with local authorities was a development prompted by concerns expressed at the height of the disaster by those local officials, some of whom are scheduled to be on the commission's next panel of the day.